The Institute Sports Secretary Soapbox was held on the final day of the Institute Soapboxes. 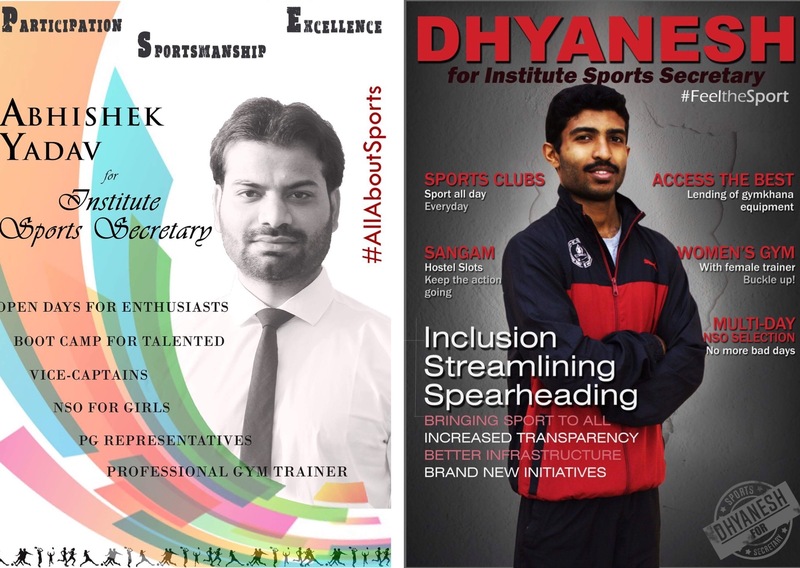 The candidates contesting this year for the position of the Institute Sports Secretary are Abhishek Yadav and Dhyaneshwaran. As per standard Soapbox procedure, the candidates presented their manifestos and corresponding visions for Sports in the Institute. As expected, there was a huge turnout for the soapbox, with supporters of each candidate cheering whenever possible. Dhyaneshwaran also put forward his proposal for providing Institute players the services of a sports physiotherapist, initiating a Sports Buddy program and giving away best player awards to increase the enthusiasm among the players. This was followed by Abhishek’s presentation. Schroeter points to be awarded on the basis of number of infra hostel events . Appointing Vice Captains for all sports to assist the captains on open day and other administrative purposes. NSO for girls in all sports. Introduction of sports orientation sessions specifically for PGs. Organising new tournaments for women that would include all sports like Throwball and handball. PG representative for each department to increase PG participation. Include waterpolo and swimming in sports fest to improve match practice for Inter IIT aquatics meet. Games village to be set up for games like Kabbadi, Kho-Kho etc. Introduction of adventure trekking club and Frisbee events. Creating a Boxing hobby group and facilitating the training of enthusiasts. Setting up an exhaust system in the Table Tennis courts to promote better playing conditions. Professional trainer for the gym . Relaying of hockey ground and basketball court in view of the inter IIT 2017. Permanent physiotherapist for players injured during the practice. Sessions with a psychologist will be arranged to improve match temperament of the players. Providing more nutritional food to the contingent members from the onset of the mini camp. Boot camp at the start of the semester to induce freshmen participation and talent discovery . Implementation of a customized mobile and web app for the Inter – IIT organizing team. As per soapbox norms, candidates were given the opportunity to question each other on their manifesto points. Dhyaneshwaran asked Abhishek about the feasibility and procedure for intra hostel points, which he answered saying that it is already happening in LitSoc events and that the hostel which conducts maximum events will get points. Dhyaneshwaran questioned the legitimacy of this proposal by saying that hostels might conduct events for namesake which would give them an unfair advantage; this was responded saying that feasibility checks would be in place overseen by vice captains. Abhishek then asked Dhyaneshwaran about how he plans to construct a pitch for the tower hostels. Dhyaneshwaran answered by saying that he intends to get a concrete pitch constructed over the existing road where students play. Dhyaneshwaran when asked about possible injuries to players responded that there will be cricket mats placed to avoid any injuries. He also responded to another follow up question over safety of buildings by saying that nets would be placed to avoid any damage to buildings. Dhyaneshwaran asked Abhishek about how he intends to start a cycling club and trekking club when the Dean (Students) has denied permission for the same. Abhishek said that the club will circulate information about tracks, equipments, costs, etc. and those who want to go can go informally. Dhyaneshwaran followed up by stating that the reason it is not allowed are concerns for safety. Abhishek responded by saying that he wants to give information about the track and to prepare people for same. Dhyaneshwaran was asked by Abhishek about the necessity of sports clubs, to which Dhyaneshwaran replied by saying that the club will have the captain and a manager/convener to ensure smooth functioning of the same, which would also ensure that the captain can focus on his practice seamlessly. Outgoing Institute Sports Secretary Sethu Madhavan first asked Dhyaneshwaran about the point in his manifesto that mentioned Sangam slotting and the feasibility of such a point. Dhyaneshwaran said he was confident that the point was feasible and explained that he’ll have hostel slots for using Sangam on regular days with preference to tower hostel and PGs. On days when he will get requests from departments, he’ll be overwriting the hostel slots for that day. Sethu Madhavan questioned Dhyaneshwaran on his idea to have NSO selection in multiple days for a single sport since they already have a lot of problem finishing the selections before Quiz 1. Dhyaneshwaran said that this is for people who can’t perform on that single day or for those who have other commitments (say, labs).To make this happen, he would have extra slots for selection during the weekends. The coach will award marks to the candidates on the basis of their performance on some drills. The candidates who missed the initial selection will have to give a justified reason for missing the selection and will be graded and given marks on the same drills. Sethu Madhavan’s initial question to Abhishek was on behalf of the women’s representatives who expressed a concern over not being approached for the manifesto and also about a point in his manifesto which stated to introduce throwball when it is already present in the Schroeter from the past two years itself. Sethu Madhavan then questioned Abhishek on the need of appointing vice captains for each sport since, as Sethu pointed out, most of the work is done by the captain, and during his/her absence the other members help do the work, so there isn’t really a need of the ‘vice captain’ which will merely be a POR. Abhishek said that he wanted to appoint vice captains to assist the captain on open days and on-field sessions. It would also help groom the vice captain to fill the shoes of the captain in the future. Another student asked the candidates about their stand on the narcotics test for institute sports persons. Abhishek said that we can have the tests but one must look at the feasibility and effectiveness aspects; Dhyaneshwaran said that any narcotics test can be conducted by a national institute and if found positive, the name of the person along with the name of his institute is revealed, and the final decision rests solely with Dean or Director. When asked about the reasons for the failure of Inter IIT Sports Meet’s failure, Abhishek said that the duties of teams were not divided properly and there wasn’t enough sponsorship money and a lack of feasibility checks. Dhyaneshwaran responded by saying that there was improper communication between Gymkhana and the organising body and also that the sponsorship money raised was so less that most of it was used up before the main meet; he ascertained that this year, adequate sponsorship money from multiple sponsors would be obtained which would solve the problem. Abhishek was criticised about the idea of a boxing hobby group because of safety concerns expressed by the dean over cycling and trekking clubs which can be extended to boxing hobby group.